Mr. Ng Kai Wa co-founded InnoMedia Pte Ltd in 1995 and serves as its Chairman and Chief Executive Officer. InnoMedia is a leading supplier of broadband IP Telephony solutions that deliver high-quality voice over IP network, targeted to the broadband service providers and enterprises. 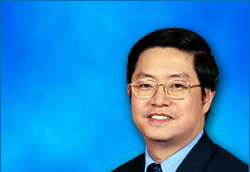 In 1981, Mr Ng co-founded Creative Technology Ltd and served as its Chief Technical Officer and Vice Chairman until 1995. He led research and product development and was directly responsible for the development of the highly successful “Sound Blaster ®”. He also created and implemented a variety of successful consumer products, including the Video Blaster ® and Cubic CT ® Apple-compatible multimedia computer. Mr Ng has been an Independent Director of Creative Technology since 2005. Mr Ng is a Board Member of the Singapore Management University’s (SMU) Institute of Innovation & Enterprise and also a Member of SMU’s School of Information Systems Board of Advisors. He is also a Board Observer at Star SoftComm Pte Ltd.
Mr Ng holds a Diploma in Electronic and Electrical Engineering from Ngee Ann Polytechnic and an Executive M.B.A. from the National University of Singapore.